Sustaining a injury to the head or neck can present many medical problems and can be an extremely serious event.As the ear is such a delicate instrument, it is particularly vulnerable to injury that occurs because of a head trauma. How Might The Ear Be Affected? 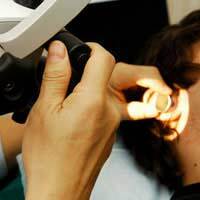 There are several ways in which the ear may be affected by a trauma to the head.Externally the ear can become cut, bruised and damaged if a sharp implement has been directed at this area of the head. This can cause bleeding to flow into the inner structures of the ear and can cause an infection.More serious injuries can include perforation of the ear drum, problems with the cochlea or dislocation/fracture of the bones within the ear structure. These can all result in hearing loss and fractures or dislocations in particular will need assessing by a specialist.As with other tissues, there is also a chance for the tissues of the ear to swell following a trauma. This can cause pressure pain and fluid to accumulate both in the tissues and in the spaces of the ear. Along with this, tinnitus is likely though this is often temporary and will disappear over time. If a person has incurred a trauma to the head it is important to seek medical advice. If the person is not able to speak or has lost consciousness, call for help immediately. Minor traumas may allow the person to seek help independently.If the person has lost consciousness or is feeling faint, help them to the floor and try and keep them alert and aware by talking to them. Reassure them that help is on the way and try and keep the calm.If an injury is bleeding apply gentle pressure to the wound to stem the flow but remember that a fracture to the skull may have been sustained so forcible pressure may be dangerous. Keep any blood soaked materials to one side to allow the paramedics to assess the level of blood loss.Try and assess for bleeding from the ear as well as loss of any straw coloured transparent fluids and inform the paramedics of this. Obviously with many of the causes of ear injury from a head trauma there can be no preventative methods due to the spontaneity of the injury but in some instances when injury is more likely there are measures that can be taken to prevent damage.For those who are involved with participation of contact sports such as boxing it is important to wear adequate personal protective equipment such as a head guard when able. Although these may not be permissible in competition, they can be worn when training.Motoring sports participants should ensure that they are wearing helmets that have not sustained any damage and that are fitted correctly. As with any part of the body, the ears are at risk of damage from trauma. This may not be apparent initially as potential brain injuries take priority before the ears are examined.Any bleeding or loss of fluids from the ear canal should be assessed as this may indicate serious damage to the inner ear structures or a possible brain or skull injury.